Earlier this month, Against Me! 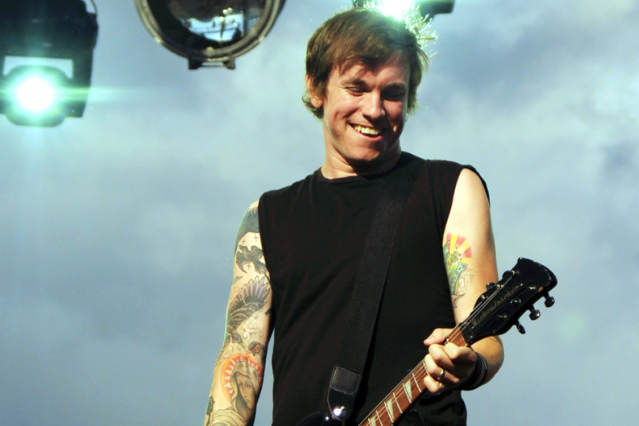 singer Tom Gabel came out as transgender and revealed plans to begin living as a woman, taking the name Laura Jane Grace. On Friday night, Grace made her live debut under the new name when Against Me! opened for the Cult in San Diego. Rolling Stone reports that although Grace made no mention of her transition onstage, the crowd cheered when she sang, “If I could have chosen / I would have been born a woman,” lines from “The Ocean,” a song from the 2007 album New Wave. In case it’s hard to tell from the video, Grace wore black jeans, black eyeshadow, and a black tank top, according to Rolling Stone, which reports that she’s two weeks into hormone replacement therapy. “I was worried that some people expected me to come out looking like Little Bo Peep or something,” Grace is quoted as saying after the show. Though the treatment raised concerns about Grace’s endurance, the only trouble she reportedly had during the set was a guitar-related technical glitch on one song. Against Me! played six new songs, among them “Transgender Dysphoria Blues,” which will be the title track of an album that’s in the works, according to Rolling Stone. The four-piece’s next show is Wednesday in Denver, followed by Omaha on Thursday and Chicago on Friday.